Are we giving Kevin Durant a pass? Game 6 between the Spurs and the Thunder went to overtime, but the former ultimately prevailed with a 112-107 win, clinching the Western Conference title and forcing a rematch of the 2013 NBA finals – although this time the Spurs will hold home court advantage. The finals changes from a 2-3-2 format to a 2-2-1-1-1 format this year to mirror the earlier rounds of the playoffs and to tire out the media crews who will be on the charter flights back and forward from south Florida to central Texas should this series go past 4. The Courtside Collective will be in attendance at most of the games in San Antonio (all, if my wife will let me), although my own prediction has San Antonio taking the series in game 6 in Miami – in a sense righting the wrong of last year when they really should have sealed the series until Ray Allen’s wonder shot (seriously, one of the all time greatest shots in any sport, I can’t emphasize that enough) brought the Heat back from the dead and put away the security cordon for another few hours. These NBA finals will be noteworthy for being the first finals since 2011 not to feature the MVP. That season, Derrick Rose became the youngest ever MVP at the age of 22 as he led the Bulls to the NBA’s best record (62-20) but were beaten 4-1 in the Eastern Conference finals by the Miami Heat. This season, Kevin Durant was on the losing side in his conference finals. On both occasions, the MVP award was taken from two-time defending MVP LeBron James, in what you could argue is (and was) simply a case of voters getting tired of LeBron’s sustained excellence. After Oklahoma lost in overtime to Memphis in game 5 of the first round (100-99), putting them on the brink of elimination, Durant was branded “Mr Unreliable” by the Oklahoman. Durant responded with 36 points and 10 rebounds in a 20-point game 6 victory, before the Thunder won game 7 by 11, behind 33 points from Durant. Durant is as popular a superstar as there is in the NBA. His MVP speech, linked here, was perhaps the least egotistical speech in NBA history. But there comes a point when questions have to be asked about Durant and his ability to lead a team to a title. He becomes an unrestricted free agent in 2016. Russell Westbrook becomes an unrestricted free agent in 2017. Durant earns $17.8m this season, $19m next season and $20.1m the season after before he hits free agency. Westbrook is getting $14.7m this season, $15.7m next, then $16.7m and $17.8m for the remainder of his contract. Just for comparison, LeBron earns $19m this season, and his opt-in contract is for $20.6m next season and $22.1m the season after (although it’s almost certain he’ll opt out and sign for less money to facilitate another title push next season – at Miami or elsewhere). LeBron James was, and continues to be, criticised for not winning a title in Cleveland. Who was his Russell Westbrook? Mo Williams? Larry Hughes? Who was his Serge Ibaka? Drew Gooden? (Interesting side note: the season the Cavs made it to the NBA finals – 2007-2008 – their salary list looked like this: Larry Hughes $13.3m; Zydrunas Ilgauskas $9.4m; Drew Gooden $6.6m; Eric Snow $6m; LeBron James $5.8m). 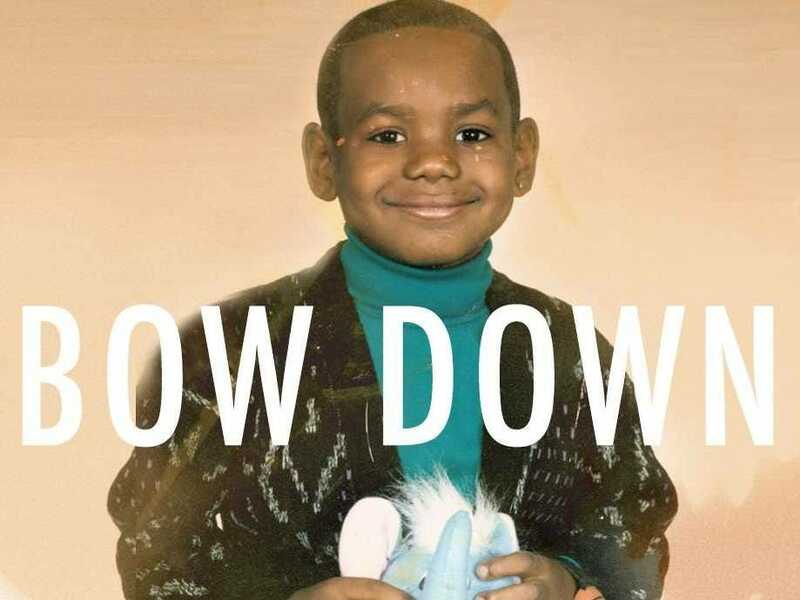 LeBron was 24 the season he led the Cavs to the NBA finals. Durant is 25. True, LeBron had played more seasons at that age, by virtue of being older and having been able to skip the solitary year in college that NBA rules forced Durant into, and it’s also true that Durant led the Thunder to the finals much quicker than LeBron was able to lead the Cavs there. One interesting thing about Durant’s MVP speech is just how deferential he was. He thanked so many people – emphasizing what a nice dude he really is – but the way that he thanked some of them, Westbrook in particular, betrayed the fact that he is simply not assertive enough. He is better than Westbrook. There is nobody on the face of this earth (aside from an ESPN talking head, perhaps) who would argue otherwise. He is capable of making shots that nobody else on the planet – LeBron included – could make, but there is something about the mix in Oklahoma, alluded to by Bill Simmons in this article on Grantland, that just does not scream “title”. What is clear is that Durant deeply loves his team-mates. Perhaps that will ultimately be what costs him. In the end it was about as easy as we thought it would be when Indiana was barely shrugging off the Atlanta Falcons in round 1 of the playoffs – or getting blown out at home by the Washington Wizards in the second round – and the Miami Heat toyed with a 50 point lead at times in the 3rd quarter, eventually beating the Pacers 117-92 to win their fourth consecutive Eastern Conference Title. Indiana had brought in just an element of doubt to the inevitability that the Heat, leading 3-1 going into game 5 in Indiana, would run away with the series after taking such a commanding lead in the series, with their 93-90 win on Wednesday night. It was, however, a win that took place in the context of LeBron James having one of his worst ever playoff games, indeed games ever, with 7 points, 4 assists, 2 rebounds, 3 turnovers and 5 fouls and Indiana still only won by 3 and Miami had a shot to win it – James kicking to Bosh in the corner who saw his three point attempt rim out. Indiana have been the definition of inconsistency these playoffs and questions will be asked about how they go forward from here. Frank Vogel’s job is apparently safe and there is no chance they would trade Paul George, who now seems on the verge of making a couple of tweaks to his game to launch him into the category of superstar by most people’s definition. David West is the model of consistency and professionalism. Other players’ futures are less certain. Lance Stephenson remains an enigma. The moronic “choke” gesture he made to LeBron in the playoffs two years ago which fired James up; blowing in LeBron’s ear, cupping his face, standing over him after he was knocked to the ground; implying he was going to force Dwyane Wade to do something to injure his knees; and the 25 points in game 2 that looked like they might help the Pacers to a win in a game where no other starter scored more than 14. Larry Bird had told Stephenson to stop trying to “get in LeBron’s head” – something he failed at spectacularly – and yet he still tried in game 6. Stephenson knows how to rile some players – Evan Turner and he got into a fistfight at practice this season – but clearly doesn’t know when he’s beaten. I genuinely would not have been surprised if he had grabbed LeBron by the nuts this series. Or pulled his shorts down. There is a lot of chatter on the internet that Stephenson’s antics have caused a number of teams – including Indiana – to drop their interest in the former second round pick out of Cincinnati. 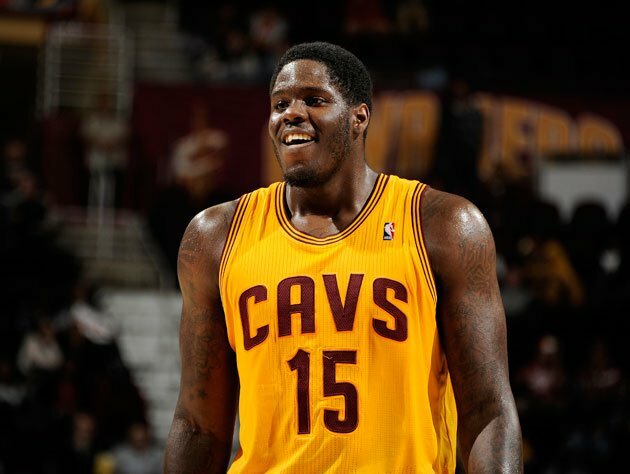 Indeed, demand for Stephenson has been bipolar this offseason, perhaps finally hitting the trough in game 6. There are rumors the team will not pick up Scola’s option for next season. Scola is rumored to be a target for Houston, who, thanks to the somewhat bizarre amnesty-ing of him, cannot re-sign him until his contract expires in 2015. Other teams will be casting admiring glances on a player who remains an offensive force, even if he cannot always guard quicker 4 men and is too short to defend the 5. Hibbert has also been enigmatic but has a lot of money coming his way and, in a league where 5 men are becoming ever more versatile, will struggle to find a comfortable match. Miami now await the winner of the San Antonio-Oklahoma City series which looks certain to go the distance. Game 6 in Oklahoma is tonight and I’m sure more are expecting another home blowout of the visitors. San Antonio have struggled to deal with the return of the “out for the season” Ibaka, but seemed to find their groove in game 5, even if it was at home. Miami will certainly fancy themselves against the one-on-one oriented OKC offense which tries to play to the strengths of Kevin Durant and Russell Westbrook – and Reggie Jackson to an extent – and they will be ready for the shot blocking prowess of Serge Ibaka after yet another series against Roy Hibbert who, for all his faults and failings this postseason, is still a full four inches taller than Ibaka and was only 0.4 blocks per game behind Ibaka in the regular season. Ibaka scores more, and more efficiently, than Hibbert and we should probably call a halt to the comparison there given Ibaka is more of a 4 man than a 5, a role usually played with little-to-no skill by Kendrick Perkins until he gets in foul trouble and is replaced by provocative rookie Steven Adams. The Spurs offer more of a challenge to Miami who are no longer able to run teams off the floor as they were in seasons past. The team is tired after four consecutive runs to the NBA finals and will have to dig deep against the Spurs who I have beating Miami in 6 in the Finals. The Courtside Collective will be in attendance at the 2014 NBA finals so keep following us on Facebook and twitter! @courtsideco and @sandersandrew for all the latest! The Los Angeles Times is reporting that the $2 billion offer for the LA Clippers tabled by former Microsoft CEO Steve Ballmer (net work estimated at $15 billion) is the highest bid the Sterlings have received for the team after the NBA began its move to force them to sell up and move on. Some are speculating that Ballmer might move the team to Seattle. Some are flatly denying that he would. Neither know for a fact. 1 – Steve Ballmer has $15bn, maybe more. 2 – Steve Ballmer was part of a group that offered to invest $150m in the KeyArena just north of downtown Seattle in an attempt to keep the Sonics in town back in 2008. 3 – Steve Ballmer was an investor in Chris Hansen’s proposal to build a new arena in the SoDo area of Seattle in an attempt to get a team back to Seattle, where it would be renamed the Sonics (all the teams records remain in Seattle and did not transfer to Oklahoma). 4 – Steve Ballmer was part of a group, along with Chris Hansen, who attempted to buy the Sacramento Kings with a view to relocating the team to Seattle. This attempt also fell through. 5 – Ballmer has said that it would be “value destructive” to move the team to Seattle. There is no logical reason for buying a successful team in Los Angeles and moving it to Seattle – LA is a bigger market…UNLESS you are the 51st richest person in the world and have a desire to bring a basketball team back to Seattle (one of the great basketball cities in the US) as part of your legacy. Ray Allen was in vintage form in the fourth quarter last night, hitting all four of this three-point attempts to help the Miami Heat to a 99-87 win over the Indiana Pacers and a 2-1 series lead with the pivotal game 4 scheduled for Sunday in Miami. The Heat started slowly and ended the first period down 7, but outscored Indiana by 11 in the third to set up Allen for yet another outstanding example of what dedication and talent can do. LeBron once again “paced” the Heat with 26 points on 9-14 shooting and Dwyane Wade was a shining example of what sufficient rest can still do for a man who many were ready to write off a year ago with 23 (9-16 shooting). Wade, a notoriously poor shooter, even threw in a three late in the third quarter for good measure. Meanwhile Indiana got double figures from all of their starters (except George Hill who had foul trouble throughout), but nobody managed more than Paul George’s 17 points. They were unable to get the ball into David West and Roy Hibbert in the post, where the two have been dominant and this was in no small part thanks to Norris Cole’s excellent on-ball D, which denied the ball handler for Indiana (Hill and Lance Stephenson primarily) the time to set up an effective entry pass. Indiana can still reclaim home court advantage with a win on Sunday but Miami know that they are still leaving something on the table in these games – notably the below-average performances of Chris Bosh who has yet to score double figure points in the Eastern Conference Finals. Last year the teams traded games up to Miami’s game 7 win at home, but the Heat have seized the advantage this time by taking two-in-a-row. A third in a row tomorrow night will surely signal the end for Indiana. Meanwhile, Serge Ibaka looks set to turn Lazarus and play in game three against San Antonio, as the Western Conference Finals returns to Oklahoma, despite being originally ruled out for the entire playoffs with a calf strain. The Spurs have rolled over the Thunder in each of the first two games and if OKC is to avoid a sweep, they badly need something from Ibaka as well as a vastly improved performance from MVP Kevin Durant. How well Ibaka’s calf has recovered remains to be seen but could prove crucial if OKC do not get a transcendent performance from Durant. Despite a 1.7% chance, a product of having the ninth worst record, the Cleveland Cavaliers will again select first in the 2014 NBA draft – riggin’ for Wiggins, concede for Embiid, sorry for Jabari, lose the handle for Randle, hex ’em for Exum, whatever you want to call it. A few of the players the Cavs didn’t select: Victor Oladipo, Michael Carter-Williams, Trey Burke, Damian Lillard, Harrison Barnes, Terrence Ross, Draymond Green, (Kemba Walker would be harsh, as Kyrie was a great pick and they wouldn’t have selected two PGs in the same draft), Serge Ibaka, Nicolas Batum, DeAndre Jordan, Omer Asik, Goran Dragic, Paul Millsap, Al Jefferson, Jameer Nelson. I’m not going to sit and go through the Cavs roster in any given season to tell you why they might legitimately have passed on some of these guys – the Kyrie/Kemba thing is as much research as I’m going to do unless you pay me – but I think it is fair to say that there are at least four of those guys that they could have drafted who would have improved the team considerably. Danny Green may be an anomaly in that he is a perfect fit with the San Antonio Spurs – likewise Jae Crowder with Dallas – but there’s no denying the two were picked then dropped by the Cavs. The Cavs more or less cannot miss with this draft. I mean, obviously they could, but if they pick one of Andrew Wiggins, Jabari Parker, Joel Embiid or even the “maybe mid-lottery” guys like Dante Exum, Julius Randle or Marcus Smart, they will have a player who should – all being well – be a legitimate starter in the league for at least 5-8 years. It is very rare for a 1st overall to flop in the league. Greg Oden has been very unlucky with injuries and it is deeply unfair to call him a bust. Kwame Brown, however, is a bust. A bust that is still in the league, but a bust nonetheless. Even if they offer the pick to Minnesota for Kevin Love, they will again be in a position to push the team forward in the very near future. Indeed the Love move might be the smartest thing for the organisation if they decide to make a push to get LeBron back, even if it will put them in a chicken-and-egg situation with neither Love nor LeBron likely to commit to the Cavs without the other having already signed and even then the guarantee of a suitable group of role players would be important to both. With Victor Oladipo instead of Bennett, they would be in a stronger position to make a run at marquee free agents. As it is, they have a group of guys (remember Luol Deng is a free agent) that hardly screams “contending within two years”. In many ways the first overall this year is as much about the ability of the Cavs to have a say in the new LeBron sweepstakes. My own view? LeBron will not go back to Cleveland. The Cavs are a minimum of three years and about half a dozen moves away from contending for a title. LeBron is coming up on his 30th birthday and I believe recognizes, partially a product of his personal financial security and partially a product of his competitive nature, that his legacy is the most important thing at this stage of his career. His legacy will not be defined by returning to Cleveland to say “sorry about ‘the Decision'”. It will not be defined by getting a max deal. It will be defined by winning at least one or two more titles. Cleveland will not give him the opportunity to do this. Whichever team offers him the chance to win NOW will be the team he signs for. San Antonio shot 58% from the field to run out comfortable 122-105 winners over an Oklahoma City Thunder team that was deprived of Serge Ibaka for “the remainder of the playoffs” with a calf strain. Now, we all know that guys in the NBA are capable of making quick recoveries – remember Paul Pierce’s wheelchair game? – and the Spurs remain cynical that Ibaka is actually done for the year, but his absence was sorely noted by Thunder fans who saw Kevin Durant collect 28 points on 10-19 shooting (4-7 from three), Russell Westbrook contribute 25 and the rest of the starters? 5 points. All from Kendrick Perkins. Reggie Jackson and Derek Fisher also played well for Oklahoma but could not overcome another stellar Tim Duncan night (27 points), 18 points from Ginobili and a 14 point, 12 assist double-double from Tony Parker. One can’t help feeling that Durant and Westbrook are good enough to win at least one game on their own, but they really need either multiple contributions from their team-mates, or else for one team-mate to step up and contribute 20+ points. Fisher came closest to that last night but at 39, he cannot be relied upon night after night. The efficiency with which the Spurs have played since they saw off Dallas in round 1 has been striking. A team hitting form at just the right time, coming up against a talented but depleted opponent spells trouble for the NBA – particularly when a slug-fest appears to be developing in the Eastern conference between Indiana and Miami. Indiana roll over Miami: where did things go right? It’s been no secret that the Indiana Pacers have been pretty bad this offseason. Indeed, March and April were tough months for them, going 14-16 and nearly ceding the East’s 1 seed to Miami until Miami seemed to ease off and accept the 2 seed – presumably because they felt that they could win their home games (in front of the ever loyal Miami crowd – that said, don’t let the empty lower bowl seats confuse you, those seats are only affordable to those who don’t really care) and take one in Indiana to give them a shot at a win in 7 over their 2013 Eastern finals foes. The Pacers somehow pulled their best game out at the right time, beating Miami fairly handily 107-96 in game 1 of the 2014 Eastern Conference Finals. 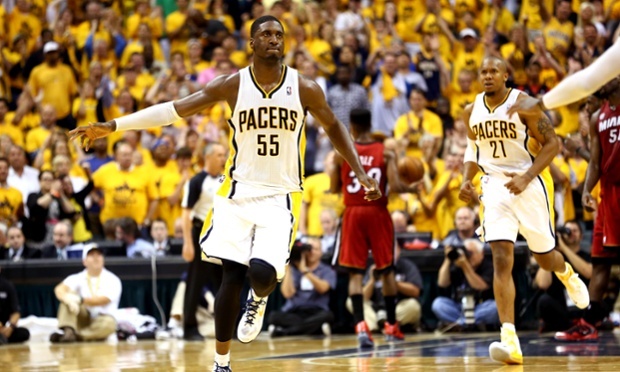 Each of their starters scored in double digits with Roy Hibbert predictably dominant. Not many people in the league enjoy playing Miami as much as Roy. Indeed, Roy doesn’t really enjoy playing many other teams – see his struggles in round 1 against Atlanta and even in spells in round 2 against Washington. This win was crucial for the Pacers. Had they suffered a blowout first loss, as they did against the decent-but-not-Miami Washington Wizards, one suspects the self-doubt that marked their performances this postseason would have returned. Instead, they bullied Miami, forced their way to the free throw line and when they were there, hit 29-37. 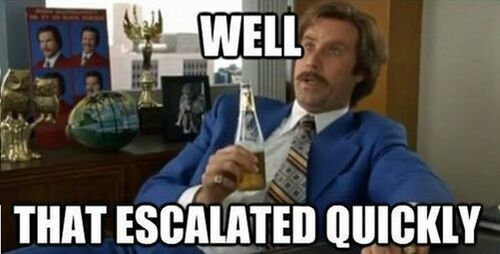 Miami only shot 15, hitting 10. When LeBron James only shoots 2 free throws, you know Miami hasn’t been attacking and the reason they don’t attack is because of Roy Hibbert. The free throw discrepancy may be pointed to as evidence of referee bias (how ironic that would be given the perception across basketball is that the Heat tend to get the rub of the green on marginal calls) but the three point discrepancy – Miami’s 26% to Indiana’s 42% told the real story. Miami looked tired. They looked pretty tired at points in the Brooklyn series and, added to the fact that they are playing the one team that seems to enjoy playing against them as much as any other, this is a very tough match up for them. They should be tired. This is their fourth consecutive trip deep into the post season. If they make the finals it will be their fourth consecutive finals. Teams don’t tend to do that these days. Indiana were good value for their win in game 1, but expect Miami to come out in game 2 with a bit more fire. In the Eastern conference finals last year it took a LeBron James triple double in overtime to sneak game 1 before Indiana won game 2. The teams traded games through to game 7 when home court advantage finally told and Miami beat Indiana by 23. Out west, the Oklahoma City Thunder will be deeply troubled by the loss of their third-best player Serge Ibaka. The San Antonio Spurs were no easy match for them before, but now one has to wonder just how much Durant and Westbrook can give the team. The dynamic pair are capable of winning games more or less on their own, but to beat this San Antonio side more than twice will be very tough. My predictions: Miami in 6, San Antonio in 5 and San Antonio to beat the Heat in 6 in the finals. I don’t even know how to describe this adequately but this video featuring the Lords of Gravity acrobatic basketball slam dunk show team, at the NBA 3X Streetball event in Bilbao, Spain, last week is a must see! The video, which has so far received 400k views, shows a member of the team, Botond Dajka, performing an incredible new trick called the ‘Backflip Off The Backboard Dunk’. Where do the Heat go from here? There are a few numbers you should all be aware of when considering the future of the Miami Heat. It is fair to say that a lot of changes are going to take place in Miami once this season’s adventure comes to an end. The hope in Miami is that all of James, Bosh and Wade will opt and and then re-sign for less money. The reality is that Dwyane Wade has no good reason to do anything other than opt in and in doing so will cripple the team for the next two years. The hope, therefore, becomes that he will be amenable to some sort of restructured offer from the Heat. Wade is thirty-two years old and is declining physically. His game was built on spectacular athleticism – hence a career 2 point average of 51% – and not on other basketball skills such as shooting – career 3 point average of 29% and free throw average of 76% bear this out. Bosh is 30 and has actually started to excel in his role as a stretch-5 for the Heat. He has shot 218 three’s this season for the Heat – his previous high for a season was 74 (last season) and then 21 (the season before that) – and has hit a respectable 34%, not exactly a go-to guy, but enough of a threat to keep defenses honest, which is the main reason to have your tallest player on the perimeter anyway. James is 29 and the best player in the NBA, only losing out to an incredible Kevin Durant season in his quest for yet another MVP. All three have played the three longest seasons it is possible to play over the past three years – three trips to the NBA finals (admittedly they won 4-1 against OKC in 2012 and lost 4-2 to Dallas in 2011 so there were more games possible in either situation). LeBron has played 37.7 minutes per game this season, slightly down on last season despite Wade having missed 28 games as the Heat attempted to ease their injury-prone guard through the regular season – although his total minutes are slightly up on last year. What does all of this mean? 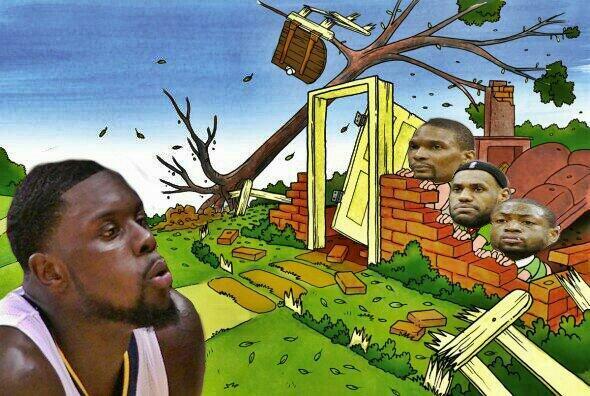 The Heat need reinforcements. Dwyane Wade, although commanding a superstar salary, is no longer capable of playing to the level of a $20m player. What do you need from a $20m player? Well, playing in more than 2/3 of the games would be a start. Chris Bosh might be deserving of that sort of salary and there is no limit to the sort of salary you could justify for LeBron. Seriously. If the league didn’t have a salary cap, how much could be earn? I’m going to say most owners would willingly pay him Ninety-Seven-Gajillion Dollars per season. He’s that good. He has this team looking like strong favourites for a fourth consecutive NBA finals appearance – their three appearances in a row equals the Lakers (2-1 twice), the Bulls (3-0 twice) since 1990 but the last team to go to four consecutive finals was the 1982-1985 Lakers, who went 2-2. Go back beyond that and you hit the great Bill Russell-led Celtics team of the 1960s which went to ten consecutive finals in a slightly smaller league. What reinforcements can the Heat get? Well, a cheaper LeBron would be a good start. Look, I know LeBron can get paid a lot more than the $20m he’s owed next year and a LOT more than whatever amount the Heat need him to take if he opts out and re-signs. The thing is that LeBron has to know, at this point in his career, that he can contend for a title for at least the next five years IF he takes less money. He deserves more, but it’s not like he’s going short. Max contracts do not factor in legacy arguments. Look at Tim Duncan – his 2003-2010 contract was 7 years, $122m. Now he gets $10m a year. Took less and still contending. This is the fact that Carmelo is starting to realise. He can get paid BIG bucks to stay in New York, but the fact that he might not is testament to the inconsistent nature of that organisation, despite the appointment of Phil Jackson. Carmelo has been rumoured to be interested in hearing from places like Houston and Chicago – two teams that seem to be a consistent scoring threat away from being serious title contenders. Carmelo knows that he has to take less money if he wants to be on a contender. Most star players, particularly those who don’t have a championship ring, realise this. The worst case scenario for Miami is that LeBron opts out and Wade and Bosh opt in. This will cripple them. Does LeBron have enough influence over his teammates to convince them not to do this? Does he even want to stay enough to ask? It seems highly unlikely that he is going to return to Cleveland, an organisation that becomes ever more dysfunctional with every passing week. The Lakers are hamstrung by Kobe’s massive contract and the Clippers would have to be VERY creative in order to create space to sign LeBron. Does he want to go to New York, an organisation of similar dysfunction to the Lakers? Can either of these teams contend in the next two years anyway?